Conservation-led travel company andBeyond opened the brand new Tengile River Lodge on December 1, 2018. Drawing inspiration from the history of Kirkman’s Kamp, andBeyond’s existing property in the reserve, Tengile River Lodge offers a fresh and contemporary take on the safari aesthetic that is a refreshing break with tradition (think sleek spacious suites rather than the classic safari tent). 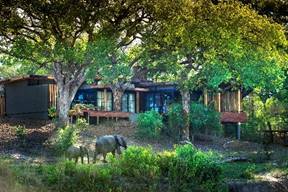 Nine exclusive guest suites are tucked deep into the riverine forest on the banks of the Sand River. Each offers 180° views over the river, looking out onto one of South Africa’s most wildlife-rich conservation areas, especially known for leopard sightings. At over 2,150 square feet per guest suite, the lodge has some of the largest rooms in the Sabi Sand. With the emphasis on both comfort and privacy, the rooms are designed to highlight the magnificence of the setting, with bespoke materials and designs that echo the colors and textures of the bush. Custom touches combine the classic and the contemporary, drawing on the area’s colorful past for inspiration. For example, stone from the Selati Railway – which used to run through the area, connecting the gold mines of Johannesburg with the port city of Maputo – has been used to create the terrazzo floors. The stones have been carefully laid out to make the most of the contrasting colors, including dark greens, shades of rust, and black. Slatted raw wood is used for the ceiling and extends down onto the walls as cladding to create the illusion of a cabin. The high ceilings create beams of natural light that illuminate the rich interiors. In keeping with andBeyond’s ethos of sustainability, the lodge design focuses on repurposed material with a connection to the setting. The stone cladding has been sourced from a local quarry and rusted metal sheets are a contemporary take on the conventional metal sheet roofing of the colonial era. The roofs have been covered in sand from the site itself, which means that, when viewed from overhead, the lodge blends into the surroundings. The lights, couches, beds, and chairs have been specially made and designed in collaboration with a selection of local designers, while the fabrics for curtains and upholstery are individually hand-painted by a group of artists in Cape Town and feature wildlife prints and elements of nature. The Wellness Centre that overlooks the river includes a gym and pool, as well as massage rooms and a sunken deck where guests can enjoy the tranquil surrounding while awaiting their treatment. Sustainability elements at andBeyond Tengile River Lodge design include thermal efficiency, a minimal ecological footprint through careful environmental auditing, as well as state-of-the-art waste water and sewer treatment systems. Situated in one of the most renowned wildlife viewing areas in South Africa, game drives traverse an area of 26,000 acres and strict vehicle limits at sighting ensure the exclusivity of the game viewing experience. Beyond the leopard sightings the area is known for, guests can also expect to see lions, hyenas, antelope, elephants, rhinos, buffalo, and hippos while embarking on the twice-daily game drives. For more information visit, www.andBeyond.com.